As a premiere gold seller, we here at Toronto Gold encourage you to educate yourself about our evaluation process by reading all of the information below. Our transparent process is an essential part of our business ethos, and for your comfort we have explained things in a way we hope you can understand. If you have any questions or concerns at all, please feel free to contact us by phone or email, or in person at our store. There are a number of ways to evaluate your items. You will be involved in each step along the way. The whole process usually takes 15-30 minutes, with the evaluation taking up the majority of the time. Very large purchases may require more time. When you arrive at 829 Bloor Street, you will be greeted in a friendly manner by one of our staff. This is a family run business, so hospitality abounds. Feel free to grab an espresso or a bottle of water. Usually one of our buyers will be able to see you right away. Depending on volume there may be a short wait. The first thing we do is sort out items that are clearly not gold or silver. Gold and silver are not magnetic, so we can easily determine which pieces are the real thing by moving an Earth Magnet over the jewellery. An Earth Magnet is not your average refrigerator magnet, but an incredibly powerful permanent magnet made from alloys of rare earth elements. The second step in sorting involves checking for purity stamps. Many stamps are visible to the naked eye, but a number are stamped on the tiny posts of earrings or are too worn down to make out. In this case we use a jewellers loupe, which gives 20x magnification. Stamps tell us what the item was sold as and are a fairly reliable way of identifying the gold purity. However, it is not uncommon to find an item stamped as solid gold that is actually gold-plated! We will group the stamped items onto a sorting grid on our desk and those that are unstamped will be placed to the side. If there are no stamps, the piece is over 18 karats, or the buyer wants to validate the stamp value of any items, we can test each item in one of two ways. Coins or bars of trusted karat and weight will skip any validation at the discretion of the buyer. The first step we use is an acid scratch test. This may be the only test that is used if the test goes well. We scratch the item on a smooth touch stone (similar to slate). This does not damage the piece in any way, but makes a fine mark on the stone. If the item is unstamped, we begin with 10kt acid and compare the ‘unknown’ item to a test key (a sample of gold of a known purity). The unknown scratch should stay very bright and solid. If the scratch fades, we return the item to the client since we cannot purchase unmarked pieces that do not meet the 10kt acid test. If the scratch stays vibrant, we replicate the test with a 14kt acid. If it passed at the 10kt level but failed at the 14kt, then we know the item is 10kt. If the item passed at 14kt we continue testing with increasingly stronger acids. If the item is stamped we will compare the item to a test key at the specific karat rather than working our way up from 10kt acid. If we find that the item performs as well as the test key, we will purchase the item at the stamped karat. If the test is close, we will give the item the benefit of the doubt. If the item clearly doesn’t test well at the stamped karat, we will work to evaluate the true karat of the item. If visual and scratch testing methods do not confirm clear results, items can be tested by an X-ray fluorescence scan. The machine used for this test is an incredibly powerful and remarkably expensive state-of-the-art device capable of providing detailed analysis by measuring the intensity of the generated gold X-rays by wavelength dispersion analysis. When testing is complete, a full report indicates the percentages of gold content as well as other alloying metals such as copper, silver, zinc, etc. This method is remarkably accurate. The Specific Gravity Machine determines the purity of gold by measuring its density underwater. [/caption]The other test that may be used is the Specific Gravity Machine that measures the density of the item. We weigh the item once on a normal scale and then once while under water. The difference in the weights determines the density of the item. Since gold is one of the densest elements, we can identify items that are gold plated and identify the purity (karat) of gold based on the density. Once all the items have been sorted by karat, we begin weighing the items on a scale. The scale is calibrated regularly and you can ask to have it recalibrated if you like. Our scale will show you the true weight of your items in grams. 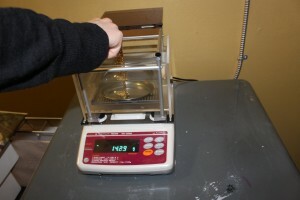 Typically we weigh all items identified at a particular karat together, but we can also weigh individual items for you. If items have stones or inserts we will subtract the estimated weight of those stones. Gems the size of 1 carat diamonds will weigh approximately 0.2 grams. We assess the rough size and number of stones in the items and subtract this weight from our estimate. For example, if a piece has 4 small stones of the 1/10th carat size we will subtract 4 times 1/10th of 0.2 grams (ie. 0.08 grams). This is only an estimate to provide an initial quote to you. Our prices are based on the current market price of gold and silver. Please reference “What We Pay” for more detail as to how these prices are set. Your payout is based on the purity (karat) and the weight of your items. We will provide our estimates to you and you will select which items you would like to sell. There is no commitment on your part. Some large items may not be solid gold or silver. These items are tricky as they can be thickly plated, or filled with weights. A final test before payment may be required by the buyer to confirm the item is not fraudulent. This can involve cutting the piece and damaging the piece beyond repair. We will ask your permission before these types of tests. Essentially, we have agreed to pay the quoted price if the item is not fake. If you do not wish to have the test performed on your item, we will be happy to return it to you, but will not be able to purchase the item. Once you are satsified with the quote and have agreed to sell your items, the buyer will remove any easily removable stones and inserts and will do their best to remove any that you specifically request. On the open market small used stones have little to no value but you may be able to use them in the design of future jewellery. Once stones and inserts have been removed, the items are re-weighed to adjust the final quote. There is no cost added for the testing or estimates as you may find elsewhere, and you will be paid on the spot without any hidden fees. To make things safer for us and for you, we have moved to a cheque-only business. Our cheques are from CIBC and can be deposited directly into your account. We want to thank you for your business and hope we have helped clarify what to expect when you choose to deal with Toronto Gold. If you have the time, we encourage you to shop around. We have no doubt that you’ll find us to be the most honest and transparent gold buyer, with the highest payout for your gold and silver.